People always seem to think that I will make them pie. I don't know where anyone got this idea from, since I pretty much bake everything but pie on a regular basis. Cookies? Sure, just tell me what type. Brownies? Okay. Cakes? Muffins? Cobblers? Lasagna? Just ask. Pie? Oh god, are you sure I can't interest you in a nice cobbler instead? Honestly, before this pie, I hadn't even tried to make one in at least 5 years; that's how much of a disaster the previous pie was. Some friends and I decided to make the pie and the crust from scratch- we made a huge mess of the dough, and the filling - ugh, the filling. 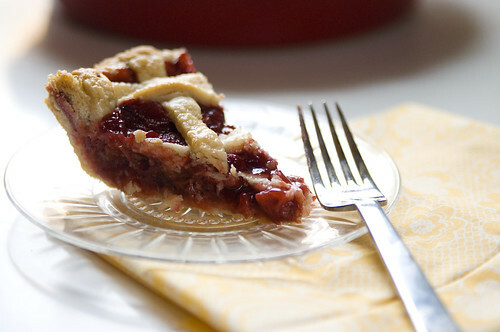 I know we wanted to make a strawberry rhubarb filling, the type with tapioca balls in it, but rhubarb wasn't in season. Hmm, what to use instead... Oh, I don't know, let's go with... bananas. Strawberry-banana tastes pretty good in smoothies and drinks, so we figured it would be a reasonable pie filling. It was not delicious. Everything boiled out of the edges of the crust, the sugar burned to the bottom of the oven, somehow the crust was still unbaked, the tapioca was still in little balls, and the whole thing was a disaster. So I don't really like to make pie. A couple of weeks ago, all of that changed. My boyfriend showed up with a box of strawberries and a few stalks of rhubarb- part of his weekly haul from a local CSA share. A pie was requested. Great. Luckily for me, I had recently found Tillie's pie crust recipe. I figured that if there was ever a pie crust recipe I could follow, it would be one used by my namesake, my great grandmother. The recipe looked easy enough that even I couldn't mess it up too badly, so I agreed to make the pie. 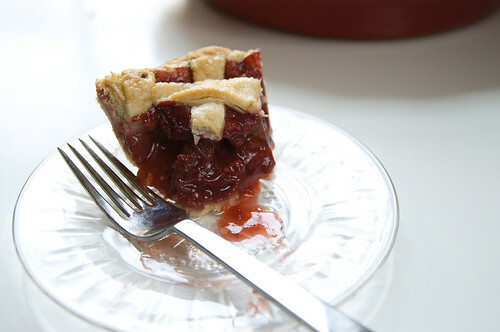 I found went online to find a recipe for the filling, since I hadn't come across a strawberry rhubarb pie recipe in the boxes, and came across this one. 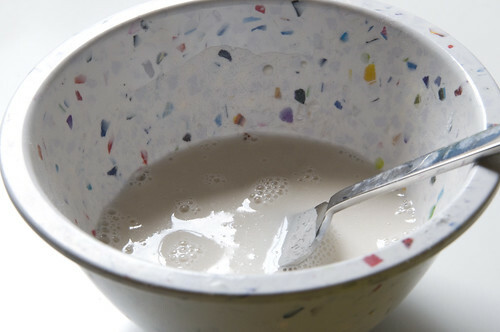 As luck would have it, it didn't involve the dreaded tapioca balls, so I got started right away. It was a good pairing of recipes, and I was rewarded with a flaky golden crust and delicious moist filling. 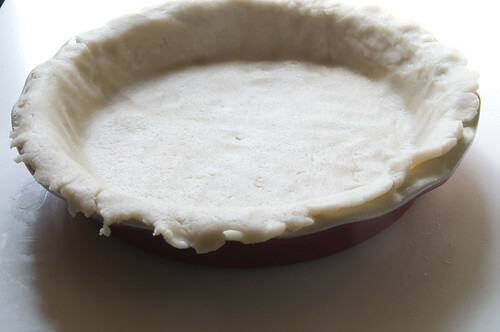 You will also need 1 egg white and 1 TSP water, to brush the crust with before baking. 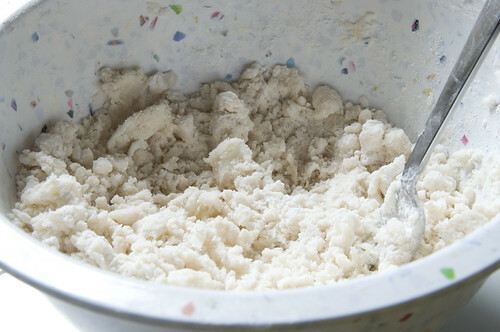 Take 1/4 cups flour and add 1/2 cup water to it, mixing to make a paste. Set aside. 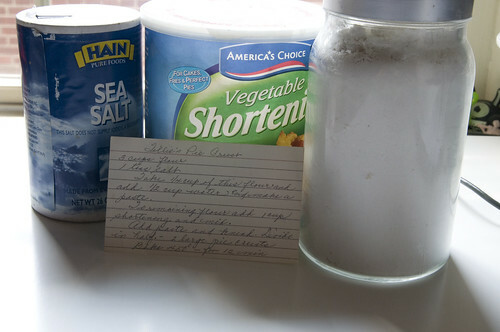 Mix the shortening and the remaining flour together. Add paste and knead till smooth. 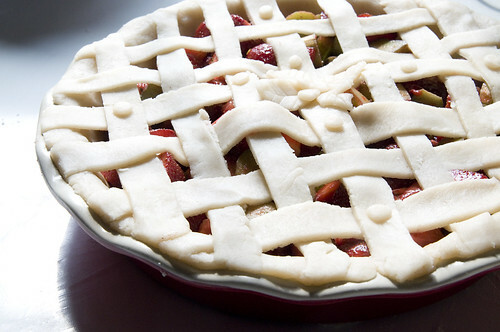 Divided in half, this will make 2 large pie crusts, or 1 closed or latticed pie crust. 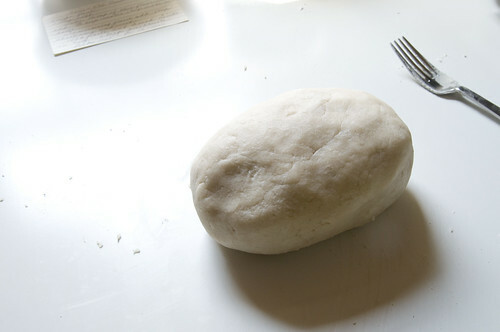 Roll out the dough on a floured surface and gentle place it in your pie dish. Trim the edges. 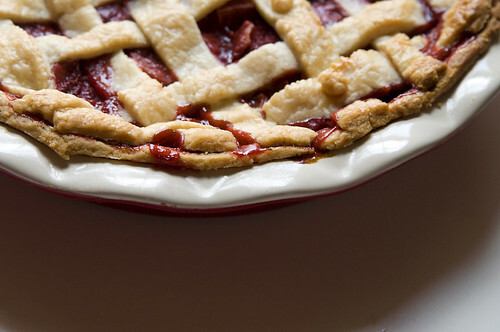 If you're making the crust for a no-bake pie, at this point you can bake it at 450 degrees for 12 minutes. Now's when I made the filling. It was incredibly simple. Take all of your filling ingredients. Mix them together. Put them in your pie dish. 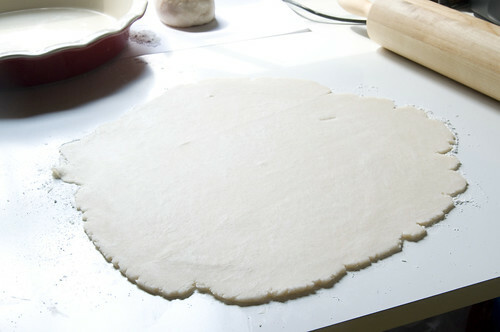 Now it's up to you if you want to roll out a big circle of dough and just cut vents in the top, or do a lattice pie crust. 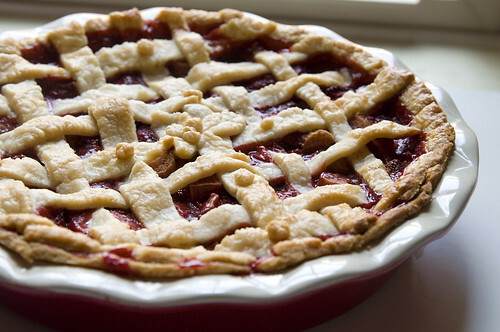 I wanted to do a lattice crust, but like I said, it's up to you. Brush your crust with the egg white, and pop the pie in the oven. For this particular pie, I baked it at 400 degrees for 20 minutes, and then for another hour and 25 minutes at 350 degrees. It seemed a bit fussy to me at the time, but the pie was delicious, so I won't argue with the directions. I took the pie to my parents, and it vanished quite quickly, which is always a good sign. 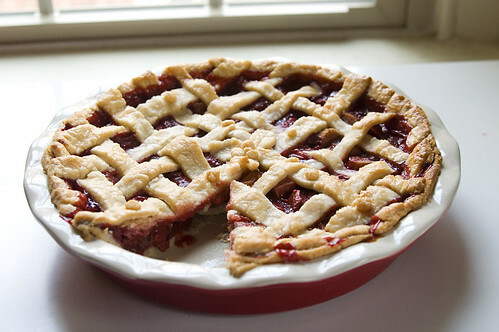 I can't wait to make more pies, next time with one of my gram's fillings.